This archieve contains older documents and earlier posts. The ICA 2018 will be held from 4 to 8 June 2018 in Berlin. With an expected 2,000 participating experts from all over the world, the ICA 2018 is considered to be one of the leading international conferences for actuarial science and mathematical finance. In February 2017, the ICA 2018 has published its Call for Papers for the congress program. The congress scientific program of the ICA 2018 will include up to 11 parallel lecture halls with about 100 slots for the presentation of submitted papers. Each parallel session will last 90 or 120 minutes and contain a number of 30- to 45-minute talks. Related topics will be grouped together in one parallel session. On 31 July 2017 the Call for Papers for the congress program of the ICA 2018 was closed. The Scientific Committee, with the corresponding subcommittees supported by the IAA section committees, is currently reviewing all submissions and deciding on the composition of the congress program. All authors will be notified if their submissionshave been accepted or denied by November 2017.
papers by practitioners describing results related to practice or open problems that might benefit from further scientific analysis. Authors of accepted abstracts have to provide a presentation, a brief bio and a portrait. Moreover, they have to agree to the distribution of the submitted material (abstract, presentation, etc.) within the scope of the ICA 2018. The Scientific Committee of the ICA 2018 will award a number of Best Paper Awards in six given subject areas. After consideration of all submissions, the Scientific Committee will decide on the number of awards and the respective cash prizes of up to € 1,500 for each subject area. The prizes will be awarded in special sessions during the congress in Berlin. Submitted papers have not already been accepted for publication in a scientific journal prior to submission. Submitted papers must be written in English and may not exceed 40 pages. will also award Best Paper Awards in their subject areas. The IAA Sections announce, organize and select the award winner independently from all submissions and/or all talks that form part of the congress program of ICA 2018. By participating in the ICA 2018 Call for Papers process, authors automatically enter the selection procedure. Prize winners will be awarded with a prize of € 1,000 each. As basis for ICA 2018 call-for-papers, the Scientific Committee has identified a wide range of main topics and subtopics. Please note that the list of main topics and sub-topics for the ICA 2018 is not exclusive. Candidates may also submit their own proposals for appropriate topics and sub-topics that are not contained in the list. Please find the detailed list with the subtopics in the full list of congress topics for the AFIR/ERM section. Please find the detailed list with the subtopics in the full list of congress topics for the ASTIN section. Please find the detailed list with the subtopics in the full list of congress topics for the HEALTH section. Please find the detailed list with the subtopics in the full list of congress topics for the LIFE section. Please find the detailed list with the subtopics in the full list of congress topics for the PENSIONS section. Please find the detailed list with the subtopics in the full list of congress topics for the joint sessions of the sections LIFE & PENSIONS. Please find the detailed list with the subtopics in the full list of congress topics for the joint sessions of the sections HEALTH & LIFE. Please find the detailed list with the subtopics in the full list of congress topics for the section IACA. Serving the Public Interest – what does it mean for the individual actuary, what does it mean for the professional association? Please find the detailed list in the full list of congress topics for Professionalism. Please find the detailed list in the full list of congress topics for the joint sessions of IACA and Professionalism. Education deals with different current and future topics on (continuing) qualifi cation of actuaries. There will be a broad and interesting program, even though Education is not part of the Call for Papers. 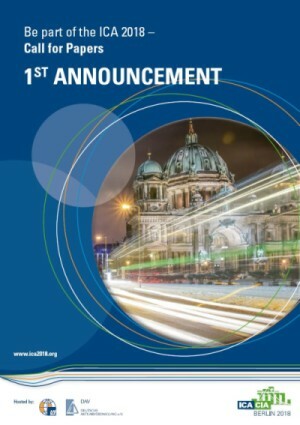 From 4 to 8 June 2018, the German Actuarial Association (DAV) in conjunction with the International Actuarial Association (IAA) will host the 31st International Congress of Actuaries (ICA) in Berlin. 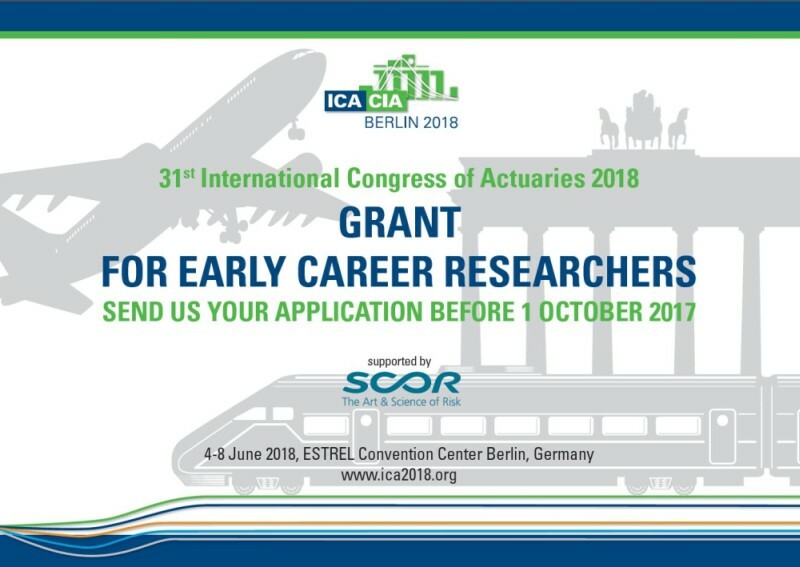 The sub-committee “Early Career Researchers at the ICA” within the Scientific Committee is delighted to announce that we are able to offer a limited number of supported grants for participating in the conference ICA 2018. Applications can be submitted until 1 October 2017 and will be assessed by the “Early Career Researchers committee”. Each of the bursaries will cover a fixed amount of EUR 500 as financial assistance for travel costs and conference fees. Unsuccessful candidates may also be placed on a waiting list. The grants are intended to support individuals who would otherwise be unable to finance the congress fees and travel costs for attending the conference. This includes early career scientists (PostDocs or young professors) who can demonstrate limited funding opportunities. Ensuring they can meet any additional travel costs associated with attendance of the conference and, if travelling from outside the EU, that they have the necessary visa and legal status to visit Germany.